A Welcome Debut: Our podcast this week was on the history of New York University, an institution which spent decades in the Bronx neighborhood today called University Heights. When they returned downtown to Greenwich Village, the campus passed into the hands of Bronx Community College, a part of the City University of New York system. 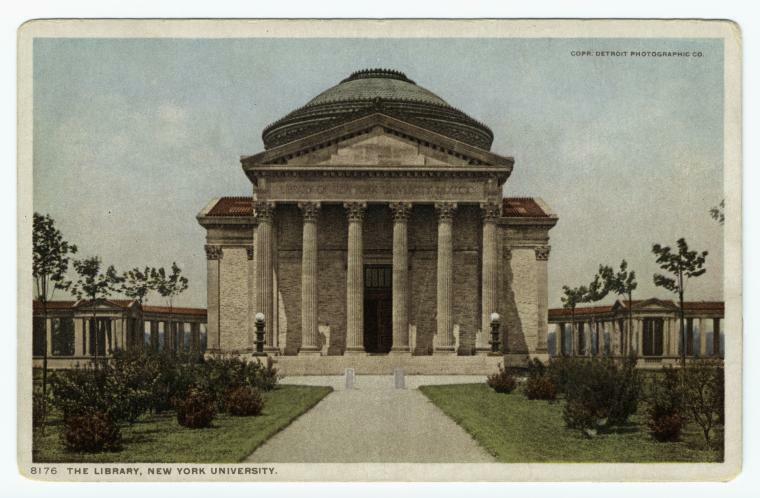 From that moment, the students of Bronx Community College have been essentially educated in second-hand properties, a collection of storied structures designed by Stanford White and a couple kooky Brutalist additions. But no longer! The New York Times reports on the opening of North Hall and Library, the first new building for the college since they moved in. And what of the fate the Stanford White-designed Gould Library (pictured above), home to the Hall of Fame For Great Americans? Read about it in the Times article here. What The World Needs Now: Songwriter, NYU graduate and New Yorker Hal David, known for his collaborations with Burt Bacharach, passed away over the weekend. David was a student at the NYU journalism school, although he would quickly find his calling in the world of pop music, and specifically at Brill Building, the venerable songwriting factory in midtown. I shall now use this occasion to honor Mr. David by presenting the one of his greatest collaborations with Bacharach. When do I ever get the opportunity to post a video by the Carpenters?